Belgium is a relatively small yet highly influential country. It has just over 30,500 square kilometers, 140th in the world, and a population over 11 million, 75th in the world, but Brussels is the de facto capital of the European Union and hosts the headquarters of NATO, the North Atlantic Treaty Organization. Its many exports include beer, chocolate, surrealism, the Smurfs, Tintin, and Jean-Claude Van Damme. But you want to know what Belgian toilets are like. Belgium is the home of surrealist artist René Magritte. Magritte produced some self-referential paintings, see the Trompe l'Oeil Toilets for an example of one of his art works, and for some surreal or at least absurd trompe l'oeil toilets. Belgian toilets aren't necessarily surreal, but some are unusual. Here is Église Sainte-Catherine de Bruxelles in Brussels. The cathedral is just across a large square from the statues of the vomiting goats. The cathedral is known as Église Sainte-Catherine in French and Kathedraal Sint-Katelijne in Dutch. It was built between 1854 and 1874, replacing a building going back to the 15th century. An old church located right next to this replacement was demolished in 1893. Hmmm. What's that under the portico on the side of the cathedral? Ah. It's a row of open-air urinals. The French term for this is pissoir. 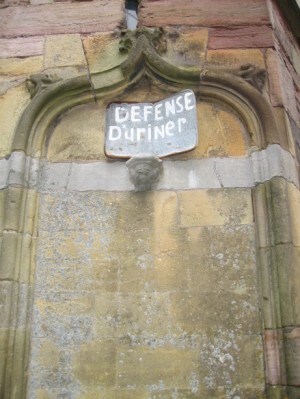 French and Dutch names for the cathedral — that brings up the point that Belgium uses two major languages: Dutch and French. The dividing line runs east-west across the country just south of Brussels, with Dutch spoken in the north and French in the south. A mix of both is spoken in Brussels, the capital. And note that the city we English speakers call Brussels is known as Bruxelles in French and Brussel in Dutch. Belgian Dutch is the majority language in the country, spoken natively by about 60% of Belgians. French is spoken natively by about 40%. But how do I find the toilet? Confusingly, we English speakers refer to the language of the Netherlands as Dutch and that of northern Belgium as Flemish, although they are as closely related as, say, British English and American English. Some words are pronounced differently, and some verbs and adverbs are used much more on one side or the other of the boundary. There are local dialects that can only be understood by the locals, such as West-Vlaams. Where is the toilet? Où sont les toilettes? Waar is het toilet? Belgian French is almost identical with the French of neighboring northern métropolitaine France, with a few minor differences in pronunciation and vocabulary. The pronunciation or phonological differences are no greater than those found between regional forms within France. Walloon is a form of French a little more divergent from that of métropolitan France, spoken by about 600,000 Belgians. Its name, Walon as it calls itself, comes from its origins in the Wallonia Region in Belgium. There are some "Belgicisms", words unique to Belgian French. This table shows a few of the ones that are not borrowings from Dutch or another language but are simply different French. The words for the numerals 60 and 90 make lots more sense in Belgian French! Notice the first Belgicism in this list. Thinking about traveling to Belgium? 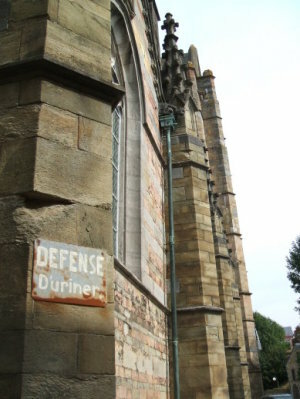 While Église Sainte-Catherine / Kathedraal Sint-Katelijne encourages urinating against its side, a large cathedral in Saint-Hubert in southern Belgium explicitly prohibits it. This is the Basilica of Saints Peter and Paul, with the majority of what we see today built between 1526 and 1564. The interiors of the lower parts of the towers date to about 1230. Speaking of open-air urinals, European toilet facilities often have a common hand-washing area shared by women and men. That makes a lot of sense, why waste space on duplicate sinks? The urinals are often in an open alcove off that area. This example at Brussels' Mappa Mundo bar shows the view from the common sink. The Belgian Thalys trains are similar to the French TGV, and connect Belgium with France, the Netherlands, and Germany. It's great service. Both Thalys and TGV trains run at 300 kph with a very smooth ride. They connect Brussels and Paris in about 80 minutes with a train leaving every 30 to 90 minutes. The Thalys trains arrive and leave Paris at the Gare du Nord station, seen here. The obvious end point in Belgium is the Brussels Midi Station. As you can see here, the Thalys lavatories feature toilets with stainless steel bodies connected to a holding tank. The opening at the bottom of the bowl is sometimes rather small. However, these toilets use vacuum flushing, eliminating almost all of the waste with a minimal use of the blue chemical solution. They're similar to current aircraft toilet designs. Thalys trains are quite modern. But Brussels, the capital of Belgium and seat of the European Union, only started building its first sewage treatment plant in 2003. Of course, not all Belgian trains are luxurious high-speed ones. This is a regional train in Dinant, in the northwestern Ardennes Forest. It has the standard foot-operated flapper valve opening directly onto the track. Look, we can see some light coming up the waste pipe from the opening. It's a straight drop onto the tracks.